Bonus: 4 FREE Saturday 9am Spin Classes! 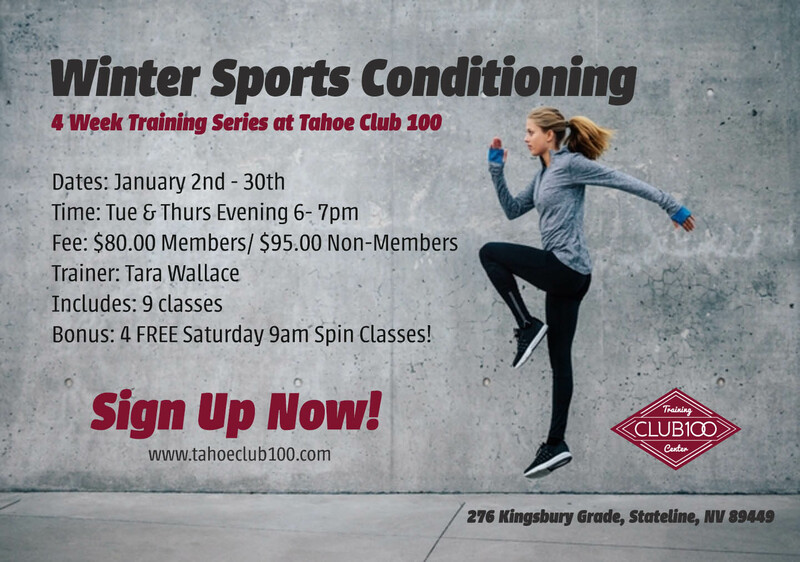 Description: This four week training series will focus on improving your strength, flexibility, balance, endurance, agility and coordination for your sports this winter. Training will be geared to improve strength and cardiovascular conditioning for stamina, stability and balance training to help prevent injury and skills to enhance your overall sports performance. Work smarter not harder as you train for your winter sports this season! Includes: Day time access to Club 100 Private Gym, Personal Training 5 Days a Week~3x a day, recipes and training homework. Description: This Boot Camp Series is for anyone looking to shed pounds, build muscle or look more toned. I will teach you the tools to get the results, the healthy way. Mental Training: Learn to use the power of goal setting and positive affirmations. Nutrition Training: Understand calories, portion control, fats, carbs. Learn the mathematics of weight control. Cardio Training: How much and how often, frequency, duration, HIIT/ steady state. Weight training: Learn why weights should be your number one priority. Understand the myths that hold you back. Learn the exercises, reps, the weight, the warm ups, the stretches, the rotation, split and when to advance. Description: This dance series will help you discover your sexiest self as you learn sensual movement, through exotic movement, yoga and dance. This four-week program also promotes weight loss, elevates energy and will increase your flexibility all while toning your muscles and firming your body. Guaranteed you’ll have a great time and leave feeling empowered, sexier and more of a goddess than ever before.